Journey’s end ….a commission completed successfully. It seems quite a long way from the summit of Mam na Gualainn, (where I first met Richard) to this photograph showing the finished painting he commissioned from me, hanging on his living room wall. The actual painting took me 5 – 6 weeks to complete but there was quite a lot to work out before I first picked up a paint brush. It must have been six or eight weeks later that I received an email from Richard introducing himself saying that he was the chap we’d met on Mam na Gualainn and that he was wondering if he could visit my studio next time he visited Scotland. This visit took place a couple of weeks later and it was great to meet him again and to hear more about his exploits in the Scottish hills over the previous I think 40 years……very impressive. Over this time he has not only reached the summits of all the Munros but also all the Munro tops too …. and was now in search of a painting based on the Scottish Highlands that would perhaps sum up what he had already done as well as looking forward to further outings. He’d been searching for such a painting a couple of months before we’d met on Mam na Gualainn and had come across my website ……only to recognise my face on the hill a little later in the summer. While visiting my studio Richard asked whether I would create a painting for him based on one of his photographs….a view from the top of Bidein a’ Ghlas Thuill on An Teallach. Although I’d never used another persons photo as a starting point for a painting, I was intrigued by this as Nita and I had stood at the very same point on Bidein a’ Ghlas Thuil a number of years previously ….and it was certainly one of the most memorable I’ve had on a hill. After a short time to consider this I agreed to try and create the painting for him. Firstly though I needed to know the kind of painting he was looking for …..as you know, my paintings vary from almost abstract to much tighter more traditional looking landscapes. We agreed that I would send him a CD containing 40 or 50 images covering a broad range of paintings and I asked him to look carefully through them and indicate which were the kind of paintings he most likes. He did his homework very well and a week or so later he contacted me with a short list, along with his reasons for liking them …he pointed out certain elements that he particularly liked and made some very useful comments. 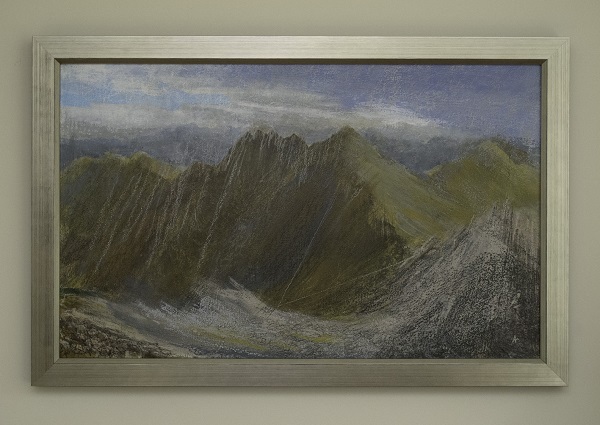 He said that he was looking for something that whilst still being recognisable as An Teallach, would also contain bold marks and the texture that he so much liked in my paintings. This information was really helpful and allowed me to visualise how the finished piece might look and therefore how to go about painting it. Sounds easy doesn’t it?! As it turned out, getting that balance proved quite difficult and in the end I probably erred more towards the recognisable. Strangely I probably drew as much on my own memories of the day we were up there as on Richards’s original photograph …certainly for the kind of atmosphere and light. We stood at the summit on a May day under darker skies with little if any sun. The photograph Richard had taken showed a large area of blue sky at the top and although this made for a great image I felt it allowed the painting to drift away. I decided instead to add a darker area of cloud at the top of the painting ….a sort of cap to hold the eye and redirect it back down into the painting. I think this also had the added benefit that it helped enhance the feeling of height and scale. I sent Richard a number of images showing the progress of the painting as well as posting a couple of them on my Face Book page, Keith Salmon – Scottish Landscape Artist. In the end though I just sent the finished painting down to him ….no photos of it beforehand. Richard asked that I supply the painting without a frame so that he and his family could select this. I know how different a painting can look when it is just there without a frame and so was a little worried that he may not see beyond the raw edges! I suggested that he spent a good few days looking at it before making any decision but I shouldn’t have worried as about a week later he kindly sent me the photos of it framed and on the wall. I have to say that I think he selected a good frame and I was very pleased with the final result ….I think Richard is too. He told me in his last email that he’d bought it as a 60th Birthday present to himself ….so then, Happy Birthday Richard. I hope you enjoy many more walks in the Scottish Highlands and maybe we’ll meet up again on a hill sometime. Enjoy the painting. Of course I can’t just leave it there …the business part of me has to spring into action now. 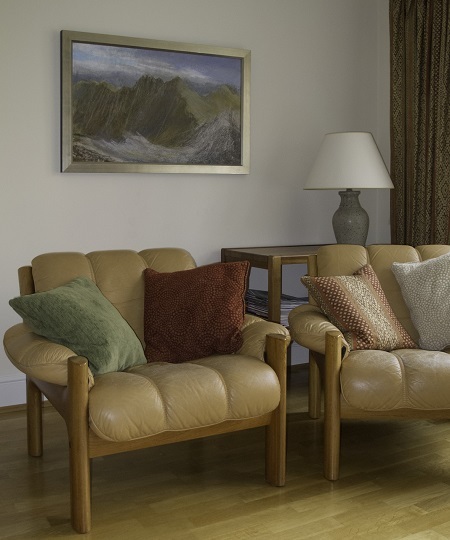 Should you be looking for a painting of the Scottish Highlands and be unable to find the right thing, you could always consider commissioning a painting unique to you. I’m always happy to consider ideas and am always up for a challenge!